There is so much to think about when it comes to pregnancy. You want the best for your baby and you know that the way in which you take care of yourself factors into that greatly. Though you may do everything right and have the best of intentions, many of us tend to give into the philosophy of “eating for two”. It’s tempting to eat whatever you want and give into the cravings, but you do need to be mindful of how much weight you put on. The pregnancy weight that you gain can not only be hard to take off afterwards, but may directly affect your baby after they are born and well into the future as well. The current standard is that you should aim to gain about 25-35 pounds with your pregnancy, depending on what your starting weight was. This sounds like a lot, but it’s very easy to blow right past that range as you feel hungry and give into the cravings. Gaining too much weight during pregnancy can make you more susceptible to the common pregnancy symptoms. Not only that, but you may cause your baby to have weight problems in the future. This could be a more indirect possibility, but excessive weight gain may also contribute to complications during pregnancy and even throughout labor and delivery. It’s very tempting to enjoy eating throughout pregnancy, and you certainly shouldn’t ever diet. It’s all about balance and ensuring that you fuel yourself and your pregnancy with the right foods in the right way. By paying closer attention to your pregnancy weight you can help to keep your own health and that of your baby under control, and therefore limit their potential risks in the future too. You put yourself at greater risk of gestational diabetes and that can mean a bigger baby: This is by far one of the biggest problems and one of the greatest risks to your unborn child. When you gain too much weight during pregnancy, you put yourself at greater risk of gestational diabetes. This is what has the most direct link to having a bigger baby at birth. These weight problems may become part of the baby’s future, though the research is still being done on that specific aspect. In any case, the risk of gestational diabetes is greater and that means that you may end up with a baby that is bigger than it needs to be at birth. Health problems due to putting on too much weight can cause preterm labor and other complications: If you weren’t concerned about your pregnancy weight then this may cause you to look closer at it moving forward. 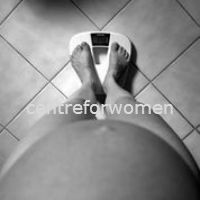 You may suffer from health problems during your pregnancy if you gain too much weight. You can cause elevated blood pressure which leads to preeclampsia as just one example of this. The more health problems that you suffer from during pregnancy, the greater the risk of having problems during labor and delivery. You may end up with a baby that is underweight if you go into labor too early, and this is just another reason to keep the weight in check throughout the pregnancy. Eating the wrong foods can cause problems during pregnancy and even for your baby after they are born: If you are eating too much junk food, too much sugar, too much salt, or too many preservatives, then you run the risk of health problems for you and your baby. You aren’t giving the baby the nutrients that it needs, and you are likely to gain weight more rapidly as a result. You want to implement healthy habits with your child, and that starts during pregnancy. Though they may not suffer from a weight problem in the future, creating a healthy lifestyle for yourself now will help you to serve as a role model for your child moving forward. Keeping your health in check is important for a healthy pregnancy and foundation for your baby: Though the research is still ongoing, the conclusion is that keeping your pregnancy weight at a healthy range will always benefit you and your baby. You help to provide them with a healthy foundation by eating the right foods and keeping your weight under control, and this will help both of you moving forward. It’s not worth the risks so eat right and take care of yourself, and then neither of you will suffer from weight or health problems moving forward which is mutually beneficial.